The multi-functional SB-700 is much easier to use especially for beginners. The SB-700 is equipped with wireless lighting capability, a feature that is indispensable to creative lighting. The SB-700 is equipped with wireless lighting capability, a feature that is indispensable to creative lighting. 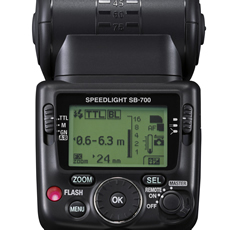 Until the SB-700, the SB-900 has been the only Speedlight equipped with a Master function*. However, a condensed form of this function has been built into the SB-700, which is also equipped with accessories such as a bounce card and a diffusion dome. * The Master function controls flash output from other Speedlights with multiple flash photography. A control layout and LCD panel design that make operating and applying settings simple, even for beginners, have been adopted. All settings can be applied in just three easy steps, and the LCD panel display is clear and easy to understand for intuitive operation. This is a new feature that allows the Master flash (SB-700) to control flash output levels for flash units assigned to two remote groups, making multiple flash photography setup simple. The flash head is equipped with an internal temperature sensor that controls and suppresses significant increase in the temperature of the flash head that may occur in situations such as uninterrupted firing of the flash with wide-angle shooting to prevent damage to the flash panel. The color filters supplied with the SB-700 (fluorescent/incandescent) have been modified from the gel filters supplied with previous Speedlights to a hard type for greater durability, heat resistance, and ease of use. In addition, when one of these filters is attached to the flash head, the SB-700 automatically identifies it and transmits information to the camera for the optimal white balance setting. multi-position power zoom function that automatically adjusts the zoom head position according to the lens focal length. Focal lengths of 24-120mm are supported. Equipped with SU-4 type wireless multiple flash photography function so well received by professional and advanced amateur photographers. This enables wireless multiple flash photography suited to a variety of situations. * When NiMH or alkaline batteries are used. Trust in our excellence in equipment servicing.